***Please enter custom colors after proceeding to checkout in the “Order Notes”. The Heavy Tomcat Rod -“SUPERFLEX”(The Original Tomcat Rod) blank is built from a strong but light S-GLASS material the Heavy is a great choice for big Blue Catfish, Flathead Catfish, Alligator Gar anything else your scared to enter the water with. It has a soft tip that can detect light bites and even a 1-2 pound fish can be noticed on the end. The heavy’s backbone is a step up from the Medium Heavy and has more “beef” to control the monsters down below. The original Tomcat needed a name so we dubbed it “SUPERFLEX”. 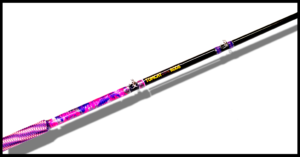 The superflex is a moderate action rod made to put on a show. For thoes who love a rod that really bows when fighting a fish, THE SUPERFLEX IS IT! A rod that has the perfect balace between strength, performance and awesome flex. 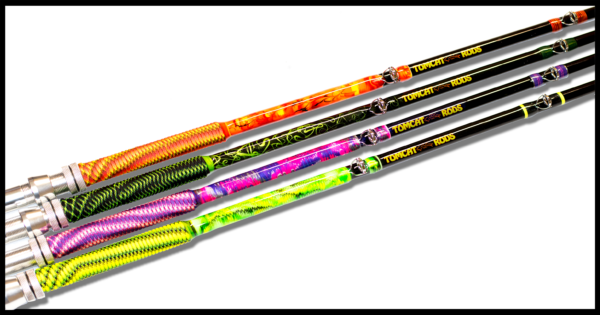 Each Tomcat Heavy is equipped with 10 Stainless Steel Guides plus a Stainless Steel tip so if your fighting a 100 pound fish or a 1000 pound log, line will never touch the blank. The handle is equipped with Tomcats Rods’ aluminum double locking reel seat and a very durable paracord handle which holds up against the abuse the rod takes from heavy take downs. It also grips firm in your hand no matter the conditions. The Heavy is an ideal choice for those fishing in Medium to large rivers, reservoirs and lakes. Or anywhere where you need that little bit of extra lead to keep the bait where you need it. 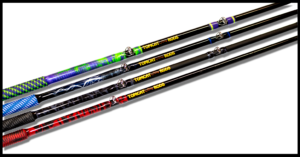 The Tomcat Heavy has been tried and tested under the heaviest and harshest cat fishing conditions. Proving itself and standing up against the some of the biggest fish any world class fishery has to offer. TOMCAT CUSTOM SUPERFLEX builds allow for you, the customer to take your options even furthur. Here is where imaginations can run wild and options are almost endless. Please inqire for options, opinions or ideas at tommy@tomcatrods.com. Custom builds have a base price of $180 and go up from there depending on time spent on rod.